Scientists in the Institute of Dental Sciences at the Hebrew University have conducted a study in which a strain on Virus was obtained from sewage which is known as the EFDG1 Virus which is being used as a Bacteriophage to help fight against strains of bacteria. The use of Bacteriophages against Bacteria is an age old process which was discontinued after the entry of Antibiotics in medical field. Because of the overuse of Antibiotics the Bacterial strains are becoming super strains against which antibiotics are becoming useless. One such bacterial strain in Enterecoccus Faecalis which plays an important role in turning Dental procedures into Systemic diseases. Enterecoccus Faecalis which is present in the oral cavity enters the circulation mainly after dental treatments and this strain of bacteria is mainly seen in Post Endodontic treated Teeth. Hence the use of EFDG1 virus against E. Faecalis is a great discovery to help control failures of Root Canal treatments. The EFDG1 phage was capable of infecting the V583 strain of E. faecalis, which is resistant to vancomycin, the most effective antibiotic against the bacterium, and according to studies the phage does not contain any harmful genes which can cause any ill effects to humans. The studies done on action of EFDG1 on E. faecalis strain lead to complete eradication of the bacteria in both liquid culture and biofilm form which is a good sign. The main factor in the ineffectiveness of antibiotics against E. Faecalis is the presence of a Bio film which the bacteria produces around it and multiple cells stick together to form a protective barriers rendering Antibiotics useless against any medicines. 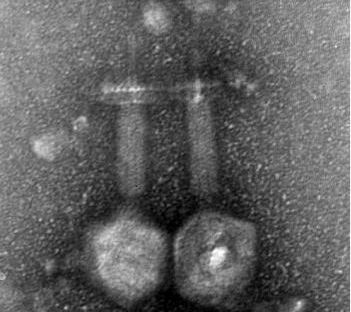 If this form of Bacteriophage can be turned into a medicine it can be really useful in Dentistry to help controls the spread of E. faecalis which is found in human gastrointestinal tract. It can also lead to infective endocarditis which is a potentially fatal heart infection, bacteremia (harmful bacteria in the bloodstream) and other serious infections, such as urinary tract infection, meningitis. Feeling good to hear such kind of news that virus has been found in sewage in which dental procedures are done to fight against bacteria. Great blog , if it is used for prevention from the virus that is really amazing tool. thanks for sharing !